I’m posting a picture of my son, not because it has anything to do with the Duplication industry or anything related to my previous blogs, but because I’m a proud father. However it’s important to note that everything we do in life has an impact on the next generation and we are very conscious of this. That is why we take it upon ourselves to run a “green” business where we recycle nearly all waste possible as well as try to reduce our carbon footprint whenever possible. At Vinpower, we care about the environment and want to leave the world in better shape for our children! Every year during the Ghost Festival, (dated July 15 on the lunar calendar), many companies, households, and temples will prepare lots of food items like fruits, drinks, cookies, etc. to â€œsacrificeâ€ for our ancestors as well as those who have died unjust deaths so they can rest in peace. We worship in the hope that society and households can be at peace and healthy. Therefore, you could see our President â€“Mr. Chang lead Vinpowerâ€™s members in a ritual ceremony to offer our â€œsacrificeâ€ sincerely. At the end of this ceremony, we burn paper money, light firecrackers and pray for our ancestors so that our business can be more successful and profitable in the coming year. In addition, there is a big traditional public event related to this festival which is held in Keelung, Taiwan every year. People will release water lanterns carrying their prayers of well-wishers one by one into the water. As the lanterns sail into the ocean they will light up the Keelung night. Even though Southern California is often a paradise for those who want year round warm weather, amusement parks, sporting events, nightlife, etc. we are often reminded that there is a price we pay for living in this desert oasis, occasional brutal natural disasters. By now most everyone around the world has seen images or heard about the â€œStation Fireâ€ in Los Angeles County and it has become the largest fire ever in the county. Even though our office is over 10 miles away from the southern most portion of the fire, the below images taken from atop our building show how massive it was. I love shopping, especially shopping on-line because it is very convenient. Moreover you can take your time, fool around and not be disturbed. We all know e-commerce is getting more and more popular nowadays but only few are really successful in this retail environment. Recently I saw an article about an analysis of the two hottest e-commerce websites (target.com & Walmart.com) and what made them successful which attracted my attention. First of all, letâ€™s take a look at the following graphs which indicate the level of various customer interaction on these sites. According to the above charts, there are three different major points to consider when deciphering whether a website resonates with the customer. 1. 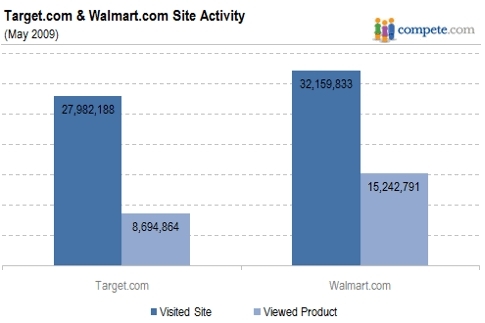 Shows the data related to viewed products â€“ turns out that Wal-Mart is ahead. 2. 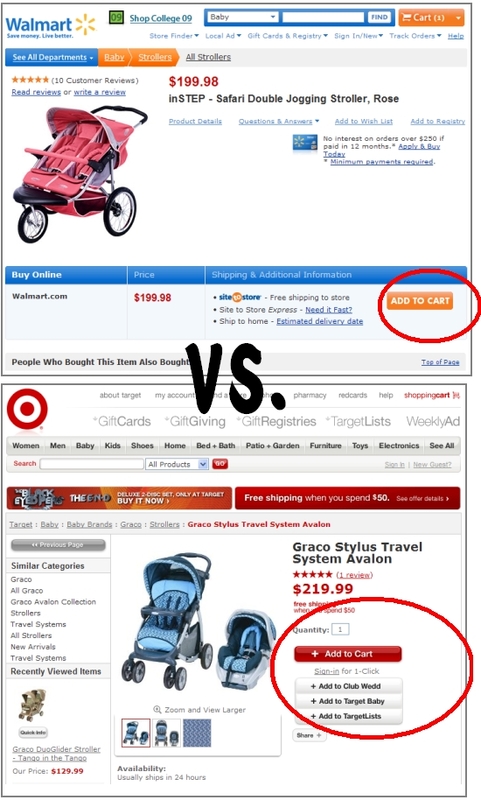 Shows the data related to items placed in the shopping cart â€“turns out that Target is ahead. 3. Shows the data related to completed purchases â€“ turns out that Wal-Mart is the big winner! Why do customers appear to prefer gathering product details and information on Wal-Martâ€™s website more so than on Targetâ€™s website? Why will customers add products to the shopping cart after browsing the product page(s) on Target more so than on Wal-Mart? Yet despite that fact, why do customers prefer to make their final purchases at Wal-Mart more so than at Target? Let us propose our theory for the answers to these questions. Looking at the Wal-Mart website, youâ€™ll find that itâ€™s easy to navigate and allows customers to easily find what they are looking for which further encourages the customers to click on the item for more details. Site navigation is critical for ecommerce websites as the more complicated it is to find an item the less likely a customer is willing to stick around and search for it, rather than just move on to another and easier to navigate website. Adding items to their check out cart is where Target excelled over Wal-Mart. In this case, Target makes it easier for the consumer to add items to their cart by placing the â€œAdd To Cartâ€ button right next to the product image and making it very obvious to see. In contrast, Wal-Mart places the â€œAdd To Cartâ€ button on the bottom right hand side of the page and can be easily overlooked by perusing customers. 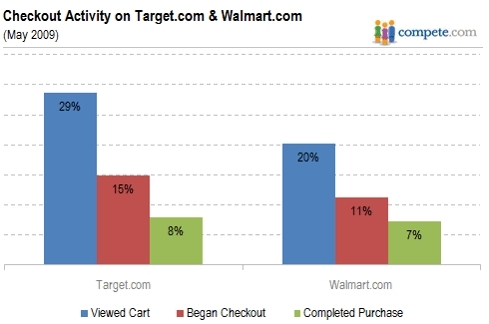 So Target is more likely to get clicks from those who are just casually browsing than Wal-Mart is. Finally, and most critically is the final sale. Why is it that almost 50% of customers decline to finalize their order transaction on Target compared to only 30% of customers on Wal-Mart? First, there are only 4 steps for the payment procedure on Wal-Martâ€™s website compared to 6 steps on Target. 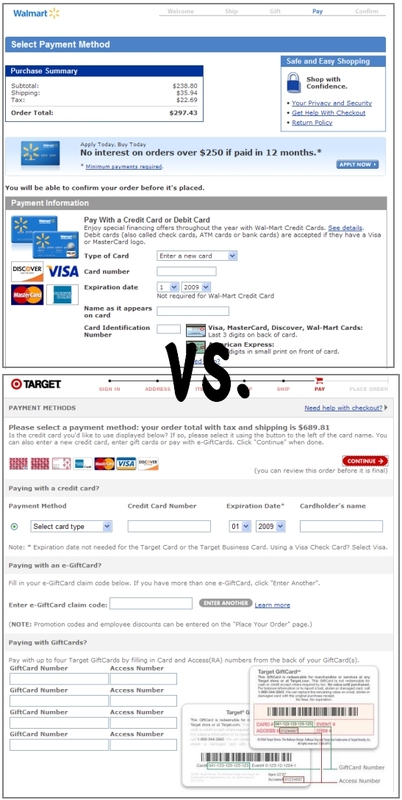 Second, there are many customer fill-in block designs on the payment page of Wal-Mart. This allows the Wal-Mart Customers to easily comprehend what needs to be filled in during the payment procedure with less confusion. On the other hand, Target emphasizes more on esthetic design than ease of use. Without the easy to identify boundaries and blocks to guide the customer through the check-out process, itâ€™s easier for customers to get confused or loose track of what needs to be filled in when they need to pay more attention on what and where to fill in. These are based more on our opinion than actual research studies, but dealing primarily in an ecommerce world where a majority of our products are sold online, we have a strong understanding of what it takes to successfully sell items online. How to develop the click through rate from the product page and eventually to the shopping cart? How to attract customers and prevent losing them? How to avoid customers losing their way in your e-commerce site? If you focus on those details, it will save you a lot of money on Internet marketing tools turning your website into a good and successful e-commerce site. Itâ€™s the little details that make all the difference! !